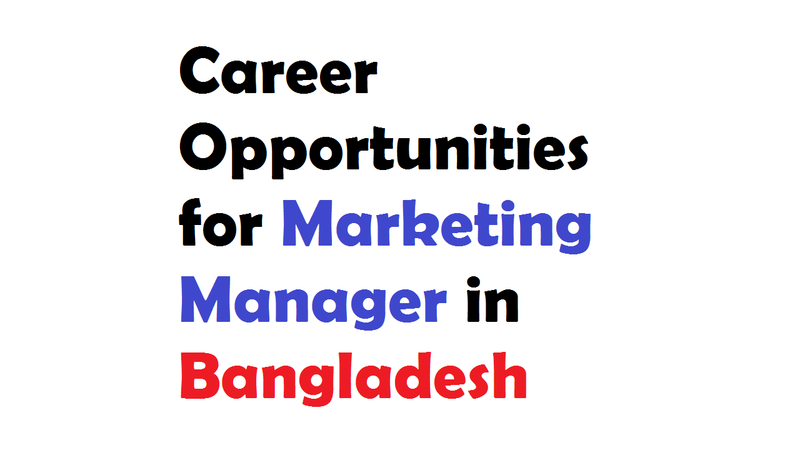 Career opportunities for marketing manager in Bangladesh. You’ll get to oversee marketing campaigns and the department itself, creating and delivering campaigns to budget along with in-line with company goals when you’re a marketing manager in Bangladesh. While using market research and analysis to ensure success, the Marketing Manager is responsible for developing and implementing new campaigns. Also, providing an exciting challenge in this competitive sector, the role is varied and fast-paced. And identifying new business opportunities are the primary objective. It depends on the exact nature of the company what forms this will takes. Moreover, you also should work to identify new markets, new partnerships, along with either new ways to reach existing markets or new product or service offerings to better meet the needs of existing markets. Apart from these, you’ll be expected to exploit these opportunities to bring in more revenue. Those who are newly qualified graduates; they can choose marketing as it’s one of the most popular career destinations for them. It’s easy to understand why marketing manager jobs are for you to make you just do it. As marketing is concerned with identifying consumer demand relative to a product or service and developing ways, the consumers can purchase these in the optimum amounts to make your company profitable. And demand for skilled and creative marketers will continue and it will be the rewards as the choice of media becomes increasingly diverse combined with our somewhat insatiable appetite for consumerism. Apart from getting a degree in Marketing and Management, for example, BBA and MBA, you need to be creative, outgoing and organized, with the ability to build positive relationships with clients and colleagues as a Marketing Manager in Bangladesh. Also, you’ll need to be confident pitching in your ideas, as well as negotiating with customers while working as part of a team, and independently. Moreover, if you have a degree in Communications, Business (and sometimes Psychology) then it can give you the edge in an interview. On the other hand, the average salary of a marketing manager is BDT18, 00,000 to BDT25,00,00 annually depending on the experience, skills, and locations. Apart from its competition, public relations develop advertising strategies such for TV or newspapers and various other media, and after-sales service, your job is to develop new products, design the packaging to make your product stand while tapping into your market’s buying habits. Along with knowledge of how to best use each marketing channel, whether it’s online or offline advertising, email or social media, strong communication training and skills are vital. Although you won’t just look after the marketing team, manage communications strategy too as a marketing manager. Also, from PR to account managers, you’ll need to coordinate with a variety of stakeholders. Moreover, from budget to delivery, analyzing the results and reporting them back to the rest of the company, the marketing managers will be required to plan marketing campaigns. If you’re starting out in the industry then experience will always give you the upper hand. It’s advisable to have some practical work experience under your belt if you want to become a Marketing Manager. But, this might either involve a summer placement or an internship or even unpaid voluntary work. You’ll need a strong sales track record to secure a business development manager job. Also, in this case, a good book of contacts is also looked upon favorably. Employers generally look for people who are articulate, polished and professional with a good telephone manner in terms of personality traits. Also, it’s essential to be a self-motivated and disciplined approach. Where you have been involved with in the mid to long-term goals for the practice area, you should be able to demonstrate. You should focus on how you can see the longer term strategic picture and demonstrate your ability to plan and priorities marketing activities to achieve these, rather than simply focusing on the incoming marketing work you completed. But, it’s not every Marketing Manager role will be right for you when the current candidate shortage has resulted in more opportunities for Senior Marketing and BD Executives to take a step up to management. You’ll also need to do an honest self-assessment of where your strengths and weaknesses lie while taking into account the key points mentioned above. And this is the way that you can be able to portray to potential employers that you are capable of operating at a more senior level. It’s more than likely you will have examples of where you have developed or coached more junior members of your team when the most Senior Executive roles do not have direct line management responsibilities. Also, it may be for either on an ongoing basis or for specific projects. And if you use these examples to demonstrate to potential employers then you have the right temperament, personality and leadership skills that will be required to be part of a management team.